The Hel Peninsula it is 36 km long sandy spit situated at the western part of Gdansk Bay at southern Baltic. The Hel Spit is long, narrow, low, relatively flat and very suitable for erosion. This area is characterised by dunes from 2-3 to 10 m high, and at some places reach the height of 13 m above sea level. Behind the spits there is the Puck Lagoon and a part of Puck Bay. The most important physical process that causes erosion is wind from direction N-NW, this creates a longshore transport of sediments towards the end of spit. There are also winds from NE direction, perpendicular to spit. In this situation are activated the circulation cells accompanying the coast erosion. Ripcurrents appearing every 120 m and the higher generation of circulation systems create crosshore currents through the gates every 3-6 km (Furmanczyk, Musielak 1999). These currents transport sandy material eroded from the coast into deep water. 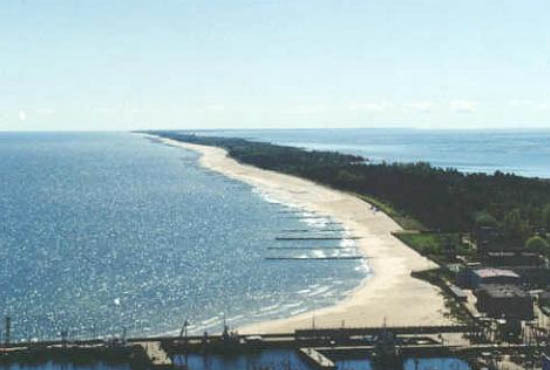 In the analyze of the long-term tendency in the development of the Hel Spit coastline, the western part of the Spit (study area),despite its coastal protection in the form of groins (about 12 km), is an area with clear predominance of erosion, with a maximum changes from 43 to 64 m in 34 years. The middle part of the spit shows both erosion and accumulation. The eastern part of the spit is predominantly accumulating, with the maximum value of about 105 m in this period of time (Furmanczyk 1994). There are three sectors of economy important for the area: fishery and fishing industry (especially in Wladyslawowo and Hel), tourist industry (on all of the area), defense and military services (especially in Hel). Erosion of the Hel Peninsula is still existing, but it is compensated by beach nourishment in the policy option: “hold the line”. Since 1990 the only soft measures were adopted with very limited hard measures, where property are or could be in erosion hazard. The beach nourishment is an optimal option of the protection for the spit. This option is friendly for tourists, because the beach is still existing, that is extremely important for tourist resort – the most important source of income.